Talking Point - Where do they speak German? "Hallo! ", "Guten Morgen!" - how to greet people in German. Starting the school day - how a class teacher and the children greet each other. Two boys meet in the street in Boppard. You will see how people in Germany greet each other, and see children arriving at a German primary school and starting the day with their teacher. These new words will introduce you to some typical sounds of the new language. Talking Point: Where do they speak German? Talking Point: Where is Boppard? Another class found that, by clicking on View Larger Map they could zoom in to explore satellite views of the Boppard area - or zoom out to see Boppard is within Germany or even Europe. They could see photos and videos that people had linked to the map. They could also plan how to get to Boppard from where they lived. The IPA was invented as a set of standard international symbols for writing down sounds, so that it could be possible to show in writing how to pronounce any language in the world. The Teacher's manual uses just a few of its symbols - see example, right - from Ch.1.5, which introduces numbers 0 to 12 in German. - for the complete phonetic alphabet. 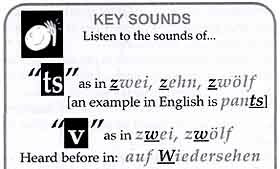 Teachers will find IPA particularly useful in checking and comparing how German words are pronounced. Full-size grown-up dictionaries, such as the 'Oxford Duden German Dictionary', use IPA to indicate how words are pronounced. This is ideal if you are looking for examples of a particular phoneme, or checking if two words contain the same sound. As with English, recordings of real everyday speech (such as those in the videos) are affected by regional accents. Also everyday speech is not enunciated quite as carefully as the dictionary's "correct" version. NOTE: IPA pronunciation guides in dictionaries are not suitable for young children. Appropriate children's dictionaries will not use IPA. In this dictionary, the entry for the German word 'zwei' is followed by the IPA phonetic spelling.. The Teacher's Manual for Ch.5 focuses on [ts] and [v]. 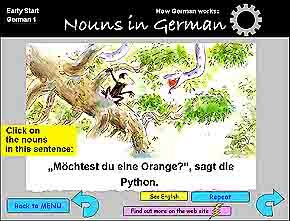 The example on the Early Start German 1 eCD is from the Talking Big Book series of CD-ROMs, which tells simple stories in easy-to-follow German. One class used the story "I want my banana" just to spot nouns. They found they could also follow a lot of the story!